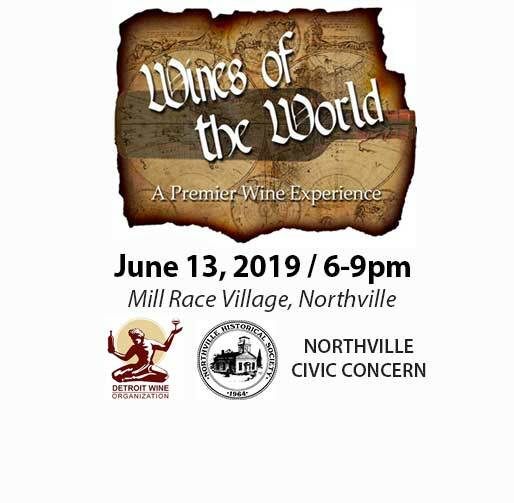 Please join the Detroit Wine Organization and Northville Historical Society at Wines of the World 2019 where you will have the opportunity to sample 200 wines from around the world in the beautiful setting from the past at Mill Race Village. Help us to raise funds to benefit the Northville Historical Society and the Northville Civic Concern. The Northville Historical Society is a 501(c)(3) not-for-profit volunteer organization responsible for the financing and operation of Mill Race Historical Village, and preservation of the Northville Archives. The mission of the Society is to discover, collect, preserve, and disseminate the history of Northville to the local community. Once the site of a grist mill, Mill Race Village is now a living museum built on land donated to the City of Northville by Ford Motor Company. Beginning in 1972, historic buildings were moved from other locations in Northville, or reconstructed on site, and the Village is now home to many such buildings including the New School Church, a one-room schoolhouse, a blacksmith shop with working smithy, a general store, a gazebo and a rustic wooden bridge. The Village serves as a focal point for the Northville community and is used for meetings, classes, weddings and other events throughout the year. 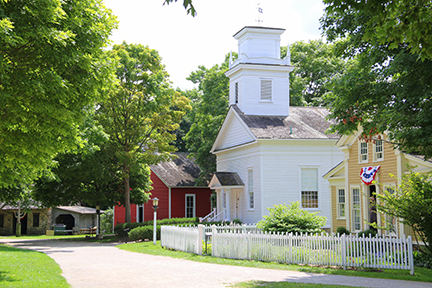 Tours of the historic buildings are provided free of charge every Sunday during the summer months, and many other free programs are offered, including events on the fourth of July, and during Northville’s Heritage Festival. We also hold lectures, historical reenactments, low cost tours, and opportunities for teachers from local schools to teach history lessons in the one-room school house. The Northville Historical Society is supported exclusively by the generosity of the community through membership fees and donations, grants and Society-sponsored events. Donations to the Village help the Society maintain the buildings and landscape of Mill Race Village, and to add programming to serve the community and educate about local, state and national history. What is Civic Concern? Northville Civic Concern is an all-volunteer organization founded in 1983 by a group of concerned citizens to benefit the needy of our community. Our primary purpose is to provide food to those in need. Food is distributed on the second and fourth Friday of each month. Northville Civic Concern is a licensed, not-for-profit organization offering temporary services to those who qualify and live in the Northville or Northville Township school districts.